These documents present the conclusions of the study “Leveraging ICT for the BoP” sponsored by AFD-Proparco, Ericsson, ICCO, France Telecom-Orange, and TNO and conducted by Hystra and Ashoka from October 2010 to June 2011. This study aimed to learn from “what works” in terms of full projects (as opposed to technologies) combining both an economically viable model and socio-economic impacts on their end-users, in the field of ICT for development (ICT4D). This work is thus based on the screening of existing projects led by various types of actors (social entrepreneurs, NGOs, private companies…), in 4 sectors of “development” where ICT has already shown it could play a key role: healthcare, education, agriculture, and financial services. 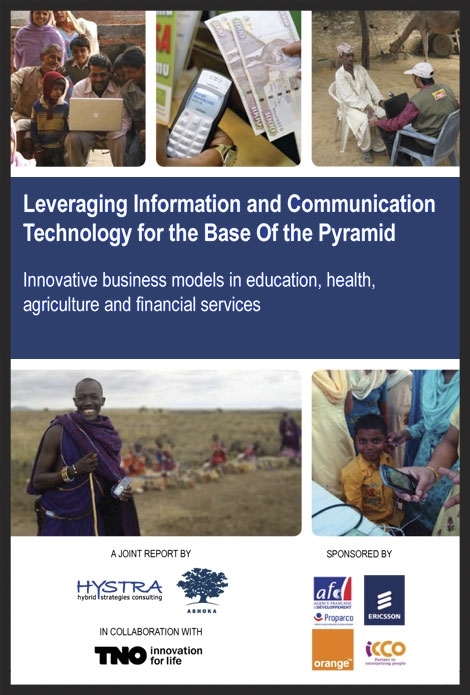 15 of the most ground breaking market-based business models, with a proven scale and results on the ground showing that ICT can be a lever improving the living standards of the BoP, are analyzed in depth in the report to support the main conclusions. We hope that this report, like ICT itself, will not be an end but part of the means to create more effective approaches to foster development.